[New York] Billionaire Steven A. Cohen’s marriage was in hot water because his wife wouldn’t tolerate the “other woman.” The other woman was Steven’s mother. This week, Cohen’s hedge fund, SAC Capital Advisors will plead guilty to criminal charges of insider trading and pay $1.2 billion in fines and forfeitures. Cohen says he’ll pay the $1.2 billion from his own pocket ”” but it’s a pretty big pocket. His net worth just hit ($9.4 billion). It would have been an even $10 billion, but last year he coughed up over half a billion for his company’s illegal trades. And it’s all Steven’s mommy’s fault. And her monkey’s. Tip to young journalists: Billionaires’ ex-trophy wives are a terrific source of information. The blonder the better. They have vengeance in their eyes and files under their mattresses. And they want just three things: money, revenge, and …money. Patricia Cohen is very blonde and very ex’d. She split from the nona-billionaire in 1990 when he was still a poor, struggling nona-millionaire. Or so he led her to believe. Patricia claims she was robbed ”” and that she firmly deserves a little of the ice from Cohen’s private ice-skating rink, the one in his garden next to his own cinema theater and indoor pool. So, Patricia, bent on justice, approached this reporter with a authoritatively detailed story of Cohen’s first inside-trading scam, documents included. 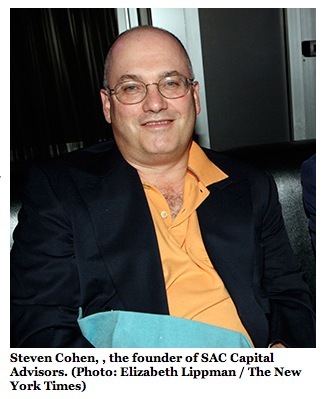 Now, I should say at the outset that, despite Patricia’s selfless exposure of the pitiless facts about Cohen’s suspicious trades, and despite the guilty plea and charges pending, I don’t for a minute believe that Steven Cohen is anything but an innocent genius. Indeed, Cohen’s brilliance borders on the clairvoyant. He knows which way a stock will move before God knows. He knows your kid’s name before you know you’re pregnant. So how does Cohen know the cards in your hand before they’re dealt? The ex-Mrs. Cohen has a different narrative. We sat in the kitchen at her Upper East Side digs, close enough to Mick Jagger’s to borrow a cup of sugar, but not on a very high floor. (Deprivation is a relative concept.) Before jumping into the facts of finance flim-flam, I first wanted to know from her why she left Mr. Bullion Baggins. “He loved his mother.” That’s no crime. “And we’d leave and half the time in the car he’d be in tears about his mommy humiliating him.” No matter how many millions and billions he piled up, he couldn’t make his mommy’s monkey jump. As a reporter, billionaires are my beat. For The Guardian, I’ve covered the Brothers Koch, Paul “The Vulture” Singer, Adnan Guns-for-Hostages Kashoggi, and many others. I’m often asked, “Why? Why is two billion or nine billion or twenty billion not enough for these guys?” Why would they play fast and loose with laws statutory and moral to make one more billion? And the answer is, They can’t make their mommy’s monkey jump. In every twisted billionaire bamboozler I’ve investigated, I’ve found a hole in their soul which they are trying to fill with wads of dollar bills, but can’t. One night, Steven was again in tears, literally crying into his pillow, sleepless. Patricia claims he ‘fessed to her that he’d secretly bought up a load of RCA stock, knowing the company would be taken over by General Electric. She also claims that she was too blonde at the time to know Steven’s RCA purchase was a crime. But she did suggest that he go to his boss and tell the truth because, whatever money he would make on the deal wasn’t worth the midnight tears. “Is $9 million worth it?” he said to her. Apparently, it was ”” because she ceased to suggest confession until she felt shafted by her divorce settlement. Well, that’s her story. Steven’s? He won’t talk to me about it ”” nor to the FBI (to whom he invoked his Fifth Amendment right against self-incrimination). The pattern of activities in past and recent indictments, including those to which he has now confessed, and the known facts of the RCA deal, comport with Patricia’s accusation. But, given Patricia’s own motive for revealing her hubby’s pillow talk, I wasn’t ready to bite. Nevertheless, we have to ask: if his first big score, the RCA-GE merger, was more than a brilliant “guess,” then doesn’t his entire $9.4 billion pot come from a scam? One afternoon, Cohen made a cool quarter billion dollars after telling one of his traders to contact a doctor consulting with Wyeth Pharmaceuticals whom Cohen knew had inside information on drug tests. The trader comes back with the info, Cohen made the trade ”” though the government can’t (yet) prove that Cohen knew the info was obtained illegally. Only the trader and SAC Capital were indicted for the crime. According to the SEC, that’s just a day in the life of SAC Capital. Really? When a Cohen sells soon-to-swoon Wyeth stock to some schmuck who’s not clued in, the “counter-party” loses his shirt. When JP Morgan labels financial feces as “prime” mortgages and dumps it on Fannie Mae, the US taxpayer gets a hosing. When Goldman Sachs and billionaire John Paulson sell the Royal Bank of Scotland “synthetic CDOs” that are as valuable as a chocolate kettle, the Bank of England pays and the people of England lose two million jobs. When hedge fund predator Paul Singer mounts a vulture attack on the Congo and makes a killing, Oxfam says he’s taking cholera medicine away from kids who are facing death. In other words: There’s no such thing as a victimless billionaire. And just this week, a New York Times columnist lauded Paul Singer a “loving father and generous donor.” Why? Because Singer tosses an insignificant amount of his ill-making gains back to support gay rights in Africa. There’s no mention that Singer has buttered “human rights” groups with cash to front his campaigns to discredit governments he has sued for billions. Keep your hospital wing, Mr. Cohen. Keep your “human rights” donation, Mr. Vulture. If you’d let the sheep you fleece keep their skin, they wouldn’t need your charity. As to your generosity, genius, and brilliant guesses ”” sorry, my monkey ain’t jumping. Greg Palast, author of Vultures’ Picnic, featuring Cohen and other billionaires, is a former expert advisor to the US Department of Justice on financial fraud and racketeering.